The original Kolosi (Kalasha) or vase-like structure at the top of the Sivadol was made of pure gold. It was too meaningless a use of the valuable gold for the British. So, they eventually brought that down. I am not sure how they did it or what they did with that (I remember a story from childhood that mentioned that they fired at it to bring it down but can’t verify it). Actually, the present gold-plated replica works fine as an ornamental topping unless someone tells you this story and kills the aura. On hindsight, probably I should not have disclosed this factoid but since I have, let’s just deal with it and move on. 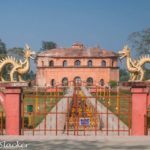 After the somewhat middling trip to Charaideu, I just had half a day to cover all the remaining riches of Sivasagar (also spelt Sibsagar). I woke up early, determined not to let this trip turn into a failure. Eventually, I did manage to cover most of them but that is a long story. As today is Mahashivratri, I am quickly sharing the sights of Sivadol. So, I came out as early as possible. It was a bright day and it was going to be too bright for photography so I decided to make the most of the soft morning light. It was a brisk 15 mins walk from my dilapidated hotel near the bus stand. I first reached the Bor Pukhuri(Grand Pond) which is also called Sivasagar (Sea of Shiva). It is a large man-made lake and actually, both the city and the district of Sivasagar are named after it. The temples were visible from a distance but the morning haze made the photograph unsatisfactory. I kept walking and finally reached the temple complex. Being a live temple, it was already open at 7.30 am for devotees. The complex actually has three temples. Apart from the aforementioned Sivadol, there are two smaller ones called Vishnu Dol and Devi Dol flanking the main structure. They look similar but much smaller. What is more interesting is that they represent two opposing faiths. The Vishnu Dol is dedicated to Neo-Vaishnavite traditions and it does not have any statue of gods or goddesses inside. On the other hand, the Devi Dol is dedicated to the Devi Shakta traditions. There was a period of schism in Assam when there was a severe conflict between the two sects. But this was probably an effort at reconciliation that came after a period of bitter infighting. The differences still exist although they no longer fight. Coming to the Sivadol, it was built in 1734 AD by Ambika, the Queen of Siba Singha. The British were already making inroads through the rest of India but the Ahom Kingdom was still at its zenith in Assam. Some of the most enduring structures were built during this period and this was an example of the same. It is 104 feet in height. There is a long Mandapa leading to the Garbhagriha or the sanctum sanctorum that houses the Shiva Linga. There are four smaller shikharas flanking the main one. The walls of all the dols are adorned with mythological sculptures. The most prominent ones are of course the devi sculptures. Some other sculptures cannot be explained easily. The sculptures are not as detailed as the ones I have seen in some other parts of the country but they probably go well with the obscure history of this land. After spending the morning here, I moved towards the Rang Ghar. But today I will stop here and keep thinking about the original golden dome for reasons beyond my control. Jitaditya , Great post. Amazing pics. Such a cool temple complex. I really enjoy visiting them too, especially when they are active. And never stop sharing little bits of history when you know them, as it makes sites and traveling to them even more interesting. Wow, I love your content, I never knew about this Place.Just one advice, Practice don’t write Mythological while writing the Article.Practice bought by the Western People.All the Stories from there are never written as Mythological, but stories from India, Japan, China and other Asian Countries are Mythological. I don’t see any problem wth the word itself. If they don’t use it, it only hurts their crediblity. Dating back t 1734, these temples are really ancient. I’m quite fascinated about Shiva temples and the stories related to them. Despite the haze, you’ve managed some really nice pictures. Great going. I just come from India, arrived 3 days ago and I am planning to go there again. Never been in Assam state but I would Love too, this place looks so beautiful, I can see through your photos.It is good to know that even they still differences they don’t fight anymore. Wow these photos are insane! I would really love to travel there. It looks like an amazing place. I have never been to Assam so this piece of information is absolutely new to me. It does look like a great and popular temples going by it’s structure. Also the architecture of temple is surely different that what we have here in North India. Since the Hinduism has three different lines of thoughts, the Shiva, the Vishu and the Devi, this temple seems to be aimed at encompassing all three branches of Hinduism.